Thank you to everyone at Danforth Diamond! My ring arrived today, and it's absolutely perfect. The only part I didn't like was having to wait for it to get here! 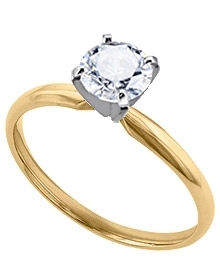 This traditional 18k yellow gold 2 mm comfort fit solitaire will feel as if it was tailor-made for you. Tell me about Settings and Shapes	 Not Sure What She Likes?